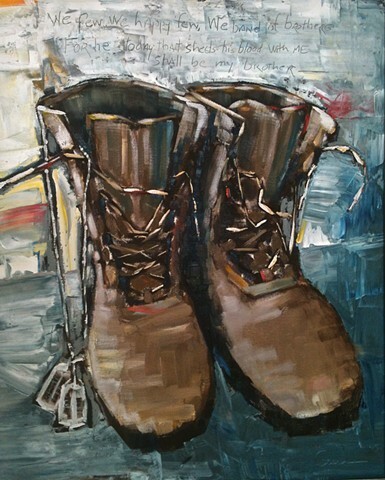 Boots and dog tags are some of the most iconic symbols of the human side of war. The commitment of “boots on the ground” is often used as the indication of real American commitment to military action abroad. The composition of upright and aligned boots, disordered laces depict a certain balance of readiness and fatigue yet dedication. The strokes of color symbolize the dynamic nature of the complex operations, activities, and locations of Special Operations Forces around the globe. The slung dog tags are a telling reminder of how very personal is the commitment of one’s service in war and how indelible its stamp of experience.